An entity from nothing space and time, Akaesman lurks in his dominion, waiting, watching through his peephole into our world for the right prey. And when he spots a good one, he forces himself into our space and time, evading the Akaesman patrol, invading his chosen one. He spreads his evil to everyone, one by one, male and female, changing them forever into his image. But the young songwriter and her fiancé, enjoying the end of their road trip, have never heard of Akaesman. "Put simply this is the best urban fantasy story that I have ever read period." Shane Porteous on She, from his Goodreads review. "I found myself caught up in the story and carried through to the end. It's not in a genre I would normally enjoy (though to be honest, in that context it's hard to classify "She"), but I did enjoy it and would strongly recommend it." Andrew Fogg on She, from his Amazon UK review. "I found this an unusual and interesting read. It was suspenseful right to the last page. I would recommend it to all lovers of Fantasy." Primula on She, from her Amazon UK review. Shireen Jeejeebhoy mayn't have been born in Toronto, but she has fully immersed herself in its fractious and neighbourly life to the point that she uses it as a character in many of her books. Jeejeebhoy received a B.Sc. in psychology from the University of Toronto. Her first book "Lifeliner: The Judy Taylor Story" won the 2008 Reader Views Reviewers Choice Award for best biography. 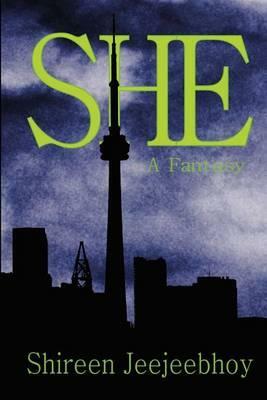 Her first novel, "She" was shortlisted for The Word Guild Awards, Novel-Futuristic Category. Through Iguana Books, she recently published "Concussion Is Brain Injury," a true life memoir of her recovery from a "mild" traumatic brain injury. Jeejeebhoy is working diligently on her next two novels. When she is not writing, reading, taking photographs, she hunts for good coffee and sensational chocolate.